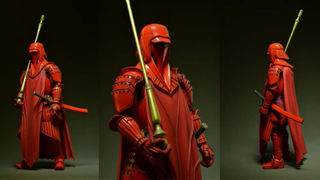 We’ve seen Bandai’s “Movie Realisation” takes on Star Wars before, turning Darth Vader and his Stormtroopers into Samurai — but now the line is expanding into amazing looking versions of the Royal Guards, Boba Fett and, as befitting any Star Wars toy line, more Stormtrooper variants than you can shake a stick at. Seriously, that thing is amazing. It’s almost like a comedy skit. You hear that excellent rhythm? Only Imperial Stormtroopers are so precise. Sadly, Bandai didn’t offer any details as to when these figures would drop, but when they do, expect the roughly $70 the previous Star Wars Samurai toys have cost.